“Stanford researchers have developed a reversible fabric that, without expending effort or energy, keeps skin a comfortable temperature whatever the weather. 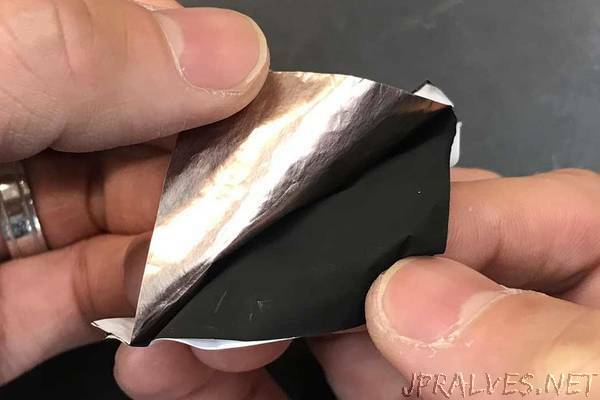 In a paper published Nov. 10 in Science Advances, a team led by Yi Cui, professor of materials science and engineering, created a double-sided fabric based on the same material as everyday kitchen wrap. Their fabric can either warm or cool the wearer, depending which side faces out. This project came out of Cui’s interest in energy efficiency and his expertise in manipulating nanoscale materials. He thought if people could be more comfortable in a range of temperatures, they could save energy on air conditioning and central heating. “Why do you need to cool and heat the whole building? Why don’t you cool and heat individual people?” asked Cui. Thirteen percent of all of the energy consumed in the United States is simply dedicated to indoor temperature control. But for every 1 degree Celsius (1.8 degrees Fahrenheit) that a thermostat is turned down, a building can save a whopping 10 percent of its heating energy, and the reverse is true for cooling. Adjusting temperature controls by just a few degrees has major effects on energy consumption. Our bodies have many ways of controlling our temperature. When it’s cold, the hairs in our skin stand out to trap warm air. Eventually, we may start shivering to produce more radiant heat in our muscles. When it’s hot, we release heat as infrared radiation from our skin, and if we’re still warm we start to sweat. Water evaporating away from our bodies carries a large amount of heat with it. But those mechanisms only help within a few degrees. Get outside the temperature range to which our bodies can adapt, and we reach for the dial on the heating or air conditioning. In 2016 the team announced a first step toward a solution: fabric that allowed the body’s heat to pass through, cooling the skin. Although they were inspired by transparent, water-impermeable kitchen wrap, their new material was opaque, breathable and retained its ability to shuttle infrared radiation away from the body. Compared to a cotton sample, their fabric kept artificial skin 2 C cooler in a laboratory test – possibly enough to stop a person from ever reaching for a fan or the building thermostat. The team’s first textile could save a building full of workers 20 to 30 percent of their total energy budget. “Right around when we figured out cooling, then came the question: Can you do heating?” said postdoctoral fellow Po-Chun Hsu, who was first author on the recent paper. It was a particularly chilly winter, and he was headed to a conference in Minneapolis with a carry-on bag full of coats. Could he create an article of clothing that would serve him in a crowded warm conference room as well as on the frosty street? Hsu realized that controlling radiation could work both ways. He stacked two layers of material with different abilities to release heat energy, and then sandwiched them between layers of their cooling polyethylene. On one side, a copper coating traps heat between a polyethylene layer and the skin; on the other, a carbon coating releases heat under another layer of polyethylene. Worn with the copper layer facing out, the material traps heat and warms the skin on cool days. With the carbon layer facing out, it releases heat, keeping the wearer cool. Combined, the sandwiched material can increase a person’s range of comfortable temperatures over 10 F, and Hsu predicts that the potential range is much larger – close to 25 F. With inhabitants wearing a textile like that, buildings in some climates might never need air conditioning or central heating at all. The white-colored fabric isn’t quite wearable yet, the team said. “Ideally, when we get to the stuff you want to wear on skin, we’ll need to make it into a fiber woven structure,” said Cui. Woven textiles are stronger, more elastic, more comfortable, and look much more like typical clothing. But good news: They’ve already started testing to make sure their fabric will be machine washable. “From my perspective, this work really highlights the significant opportunities in combining thermal engineering concepts with nanophotonic structures for creating novel functionalities,” said Shanhui Fan, a professor of electrical engineering who participated in the work. The team’s ambitions are to create an easily manufactured, practical textile that people could use to save huge amounts of energy around the world. And they don’t stop there – Cui, Hsu and Fan envision clothing with medical devices and even entertainment printed right into the fabric. “I think we are only seeing the beginning of many creative ideas that can come out of such combinations,” Fan said. Cui is also professor of photon science at the SLAC National Accelerator Laboratory and a member of Stanford Bio-X, the Precourt Institute for Energy and the Stanford Neurosciences Institute. Fan is also an affiliate of the Precourt Institute for Energy. Other Stanford researchers who contributed to the study are postdoctoral fellows Chong Liu, Alex Y. Song, Jin Xie, Kai Liu and Lili Cai; graduate students Ze Zhang, Yucan Peng, Chun-Lan Wu and Shang Zhai; senior research engineer Peter B. Catrysse; and Arun Majumdar, a professor of mechanical engineering and of photon science and co-director of the Precourt Institute for Energy.